Last night just before the humans in our house ate dinner, Elizabeth gathered her beloved blanket, Kiki, and Paulie's ugly doll, Babo, for a friendly tête-à-tête over felt food. They dined on their new reclaimed teak wood dining table, which formerly held my Mother's Day gifts from Paul, and sat on lovely corrugated seating. Elizabeth is famous for her dining parties around here, and I think kid-hosted, animal/doll/blanket parties would make a good series. So comment here if you'd like to participate. On Friday, I'll post the links to all participating blogs. That is so incredibly cute! A blanket sure looks full of personality when rolled up and having a nice dinner! Those pretzels are so cute! The blanket cracks me up, haven't seen that one before. Love her creativity! Those butterflies are fun, nothing like chocolate and salt. My son, whose sitting with me, is now asking me to make those pretzel butterflies. :) I love the doll/ dining photo. I'll see if I can catch something like that this week. adorable! I hope Naomi's imagination lasts like elizabeth's is. I love these imaginative moments. Melissa, the food is grilled cheese sandwich, corn, cheese, blueberries, baked potato, orange, plum and blueberry pie in the middle. 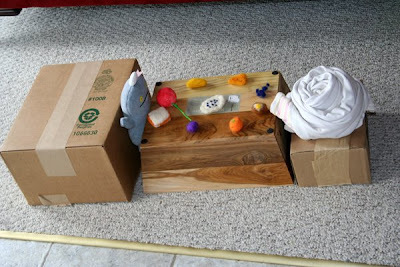 :) I have no idea what came in those boxes; we keep a pile in the garage when they come so the kids can use them at will. 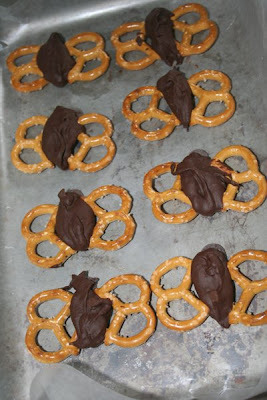 I'm glad the pretzel butterflies turned out well! If I can figure out how to take a picture of my son's toys with the built-in camera on the computer, I'll join in on Friday. He's been playing a lot with the pirate bendy dolls, so it may be a pirate party. 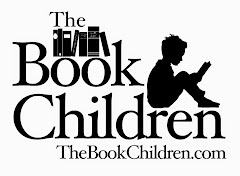 That book is our ancient Childcraft Mother Goose. Isn't it amazing? We have one with longer poems and ballads and the Mother Goose one, as well. I think the copyright date is 1953 if you are looking for one. Oops, I meant what was in the wooden box? Or was that the present itself (it's beautiful.) Where did you get the food? Melissa, the book is beautiful. The wooden box came with 6 bars of different varieties of dark chocolate and a membership to the wine club at WineStyles. :) The man knows what I like. How lovely to meet you! I found your comment on my blog. What fun those pretzel butterflies looked like! There is nothing better than soaking in those magic moments with our little ones, eh? A blanket dolly....that is about the sweetest thing I've ever heard of!!!! !